Fossil fuels consumption in the electric power sector declined to 22.5 quadrillion British thermal units (quads) in 2017, the lowest level since 1994, according to the U.S. Energy Information Administration. 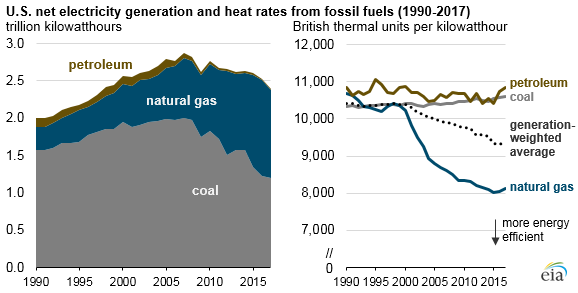 The declining trend in fossil fuels consumption by the power sector has been driven by a decrease in the use of coal and petroleum with a slightly offsetting increase in the use of natural gas. Changes in the fuel mix and improvements in electricity generating technology have also led the power sector to produce electricity while consuming fewer fossil fuels. In 2017, coal consumption by the electric power sector reached its lowest level since 1982, and petroleum consumption in the power sector was the lowest on record, based on data since 1949. Recent natural gas consumption in the power sector has generally been increasing, but 2017 consumption was slightly lower than the record-high 2016 level. In energy-equivalent terms, more coal was consumed in the power sector than natural gas in 2017, at 12.7 quads and 9.5 quads, respectively. However, in terms of electricity generation, natural gas-fired power plants in the electric power sector produced more electricity than coal-fired plants, at 31% and 30% of the U.S. total, respectively, in 2017. Natural gas-fired units tend to be more energy efficient, requiring less energy content to produce a unit of electricity. As recently as 2000, natural gas-fired power plants were on average about as efficient as coal-fired plants. Since then, new natural gas-fired power plants have tended to use combined-cycle generators, which are more efficient because the waste heat from the gas turbine is routed to a nearby steam turbine that generates additional power. Combined-cycle units now make up most of the natural gas-fired electricity generation capacity. By the end of 2018, natural gas combined-cycle units may surpass conventional coal-fired power plants to become the most prevalent technology for generating electricity in the United States. As the natural gas-fired generation fleet has grown and become more efficient, the generation-weighted average efficiency of fossil fuel-fired electricity generation has improved. In 1994, fossil fuel power plants required 10,400 British thermal units (Btu) of primary energy to produce each kilowatthour (kWh); by 2017 that rate had fallen to 9,400 Btu/kWh. These changes in energy consumption and efficiency have also affected carbon dioxide (CO2) emissions from the electric power sector, which in 2017 were the lowest since 1987. 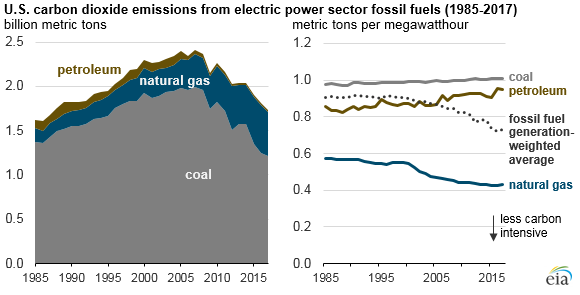 Because coal combustion is much more carbon intensive than natural gas combustion, CO2 emissions from coal were more than double those from natural gas in 2017, even though natural gas provided more electricity generation.